Adobe has formally unveiled Creative Suite 5, including a a significantly expanded version of Photoshop, with new tools ranging from "Content-Aware" spot healing to paint brushes that can mix and blend with the canvas. We have a first look at some of the major new features coming up in the latest release. With the announcement of a new Creative Suite, Photoshop has, as usual, received the bulk of the pre-release chatter, with the new "Content-Aware" fill and spot healing tools front and center. Adobe provided a public preview of these new features prior to today's formal announcement of Creative Suite 5, which you can find here. The examples shown in that demo were impressive, but a lot of what was demonstrated could have been accomplished fairly easily with tools as old as the Spot Healing Brush n Photoshop CS2 (examples here). But the new content-aware capabilities introduced in Photoshop CS5 take it to the next level with greater sophistication, the ability to handle more complex scenes, greater speed, and a better ability to blend fills with the patterns in the existing background. On this last point, the movie below illustrates the use of the new Spot Healing brush with the "Content Aware" option selected. You'll see that as it replaces the element painted over, it forms a fairly seamless continuity with the brickwork in the images and produces, at the very least, a good starting point for the artist to go in and do some simple cleanup. Photoshop CS5's content-aware functionality brings significant improvements to the Spot Healing brush. It's also more versatile than the previous tools available. In the clip below, again the new CS5 Spot Healing brush with the "Content-Aware" option is invoked to remove objects from a scene. In this case, we'll remove all of the people from the picture, leaving only the background. You'll see a few artifacts left behind, but, again, it's a tremendous starting point with very little effort. Photoshop CS5's content-aware spot healing used to remove foreground elements in a more complex image. But Content-Aware fill and spot healing aren't the only major additions in Photoshop CS5. In the latest release, Photoshop gains new 3D capabilities, a new IK-like warp tool, and one new feature that I consider even more significant than content aware fill (although Adobe has barely mentioned it): enhanced paint functionality. Until now, Photoshop's paint engine hadn't been touched in any significant way since version 7 (five full versions ago). But with CS5, it gains an entire new category of brushes--bristle brushes--and a whole new way to apply paint to a canvas. Bristle brushes can use any of 10 available tip shapes, ranging from round, blunt tips to flat fans. Users can control the number of bristles and bristle length, stiffness, thickness, and angle. Most standard Photoshop brush parameters can also be used with bristle-style brushes, with the exception of "Dual Brush" parameters. The movie below shows some basic strokes generated with a bristle brush in standard brush mode. 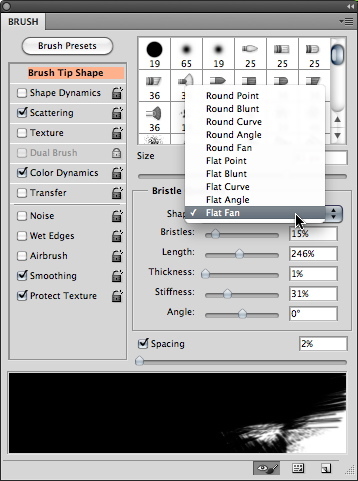 Basic bristle brushes in Photoshop CS5 behave much like ordinary brushes but include settings for brush tip shape and various bristle parameters, such as length and stiffness. But the new bristle brushes really come to life using the Mixer Brush tool, which brings a more painterly approach to painting in Photoshop. As seen in the short clip below, the tool lets artists apply settings to emulate wet or dry brushes and adjust the amount of "paint" on the bristles. It includes several Mixer Brush presets, but the parameters (wetness, load, and mix) can also be controlled manually. But bristle brushes can also be used as "Mixer Brushes," which have the ability to interact with the canvas, smearing the background and mixing in foreground color. It's worth noting that even with the revamped paint engine, older brushes (dating back at least to Photoshop CS) continue to work as they did in previous versions of Photoshop. Older brushes can also be used as Mixer Brushes, although some parameters are disabled, such as Dual Brush, Color Dynamics, Noise, and Wet Edges. Taking a cue from 3D and motion graphics systems, Adobe has brought a new system to Photoshop CS5 that resembles, in some ways, inverse kinematics (IK)--that is, a structure of bones and joints dependent on one another for motion. But the tool isn't true IK. Rather, it's a new type of warp function, called Puppet Warp, that lets users create "joints" on an object (a layer or a layer selection), then move portions of the object associated with those joints. The clip below shows the Puppet Warp tool in action. Photoshop's Puppet Warp feature in action on a stick figure. A wide range of performance and workflow improvements--some major (like native, cross-platform 64-bit support), some minor (like the ability to save 16-bit images as 8-bit JPEGs in a single step, rather than having to convert the image prior to export). Further information about Adobe Creative Suite 5 and the Creative Suite launch event, scheduled for April 12, can be found here.